Just in time for the holidays, master pastry chef and cookbook author Nick Malgieri, from the New York Culinary Institute, shows The Early Show how to construct a traditional gingerbread house. Start early. There's never enough time for projects like this, so get a head start and you won't be rushing to complete your house at 3 a.m. on Christmas morning. Keep it simple. Don't attempt something overly elaborate, especially if you are a first-time gingerbread house maker. Use a real recipe that comes with a pattern and instructions for finishing. Having clear instructions makes a big difference. If you don't understand the instructions, look for another recipe. Be careful about measuring ingredients. This makes all the difference between an easy-to-use dough versus one that's too dry (it crumbles) or too wet (it sticks to everything). Roll the dough evenly and use a steady, but gentle pressure. Dough of an even thickness bakes uniformly. Make sure all the pieces are completely cool before starting to assemble the house. Be generous with the icing for gluing the house pieces together. Any excess will be inside and not seen, or can be scraped from the outside, which will be covered with decorations anyway. Decide on a design and color scheme for decorating the house. See which candies or nuts look good together and limit yourself to those. Use enough to make the house look festive, but not so much that it will look heavy or overburdened. Practice applying decorations to a piece of cardboard to see how they hold in place. A little test like this can make a big difference. If the kids are helping, make simple houses so each can decorate his or her own. This is the time for graham cracker houses and icing from the supermarket! Above all, have a good time. Remember it's fun, not drudgery. Preheat the oven at 350 degree F. Line 2 baking sheets with waxed paper. In a saucepan, combine molasses, brown sugar and butter. Heat gently, stirring occasionally, until melted. Sift flour and ginger and cinnamon into a bowl. Stir baking powder into melted mixture; add water and salt and mix until dough forms. Roll directly into baking sheets about 1/4" thick and cut pattern pieces. Bake for 10 to 15 minutes. Mix everything in a bowl and beat at medium speed until you have stiff peaks that don't sag. Royal icing cannot be overbeaten. 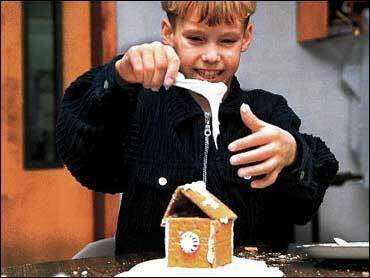 Building Gingerbread House: Make sure you build your house on a sturdy flat board. Let walls and sides settle before you add roof (it might collapse due to the angle). Decorate the house starting from roof. The last thing you should be decorating is the "yard." Let house set for at least a day before you store it or pack it. Do not wrap it with plastic film. The house should "breathe." Should you wish to save it for the following year, you can spray it with satin varnish and let it air for a couple of days before you put it a light cardboard box. The varnish will unfortunately make the house inedible put will protect it from cracking or melting. Make sure you store it in a dry cool place. Keep it away from heat and moisture.